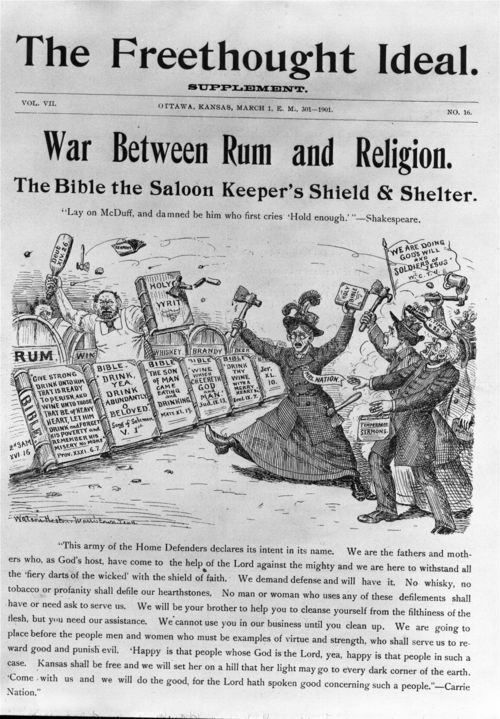 An illustration portraying a caricature of Carry Amelia Nation leading a mob against a beleaguered saloon keeper who is defended by bible scripture in support of wine and drinking. Nation was a member of the Women's Christian Temperance Union and a crusader against alcohol in pre-Prohibition America. She was arrested 30 times between 1900 and 1910 for smashing bar fixtures and bottles of liquor with a hatchet. This political cartoon will help students understand that Carry A. Nation was a nationally known figure who was important in influencing events of the day.